This stunning table lamp has a classic gourd shape in mercury glass. Your decor will shine with the help of this table lamp. A gorgeous design by the 360 Lighting brand, this stunning table lamp has a classic gourd shape in mercury glass. Overall: 24 3/4" high. Shade is 11" across the top x 13" across the bottom x 9 1/2" on the slant. Bottom base is 5 1/4" wide. Takes one 150 watt medium base bulb (not included). On-off socket switch. Mercury glass body. Brushed steel bottom base and finial. 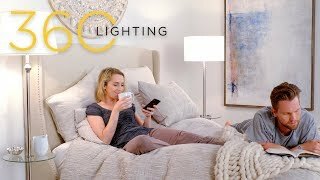 Gourd table lamp from 360 Lighting. 8-foot clear cord and plug. Net weight 4.40 pounds. how much does this lamp weight? BEST ANSWER: 3 pounds at the most. It is stunning. Does Mercury lamps have mercury in them? Quick delivery, arrived in perfect shape (packaging was extremely secure) and the lamps are beautiful!!!! Quality is great for the price ???? Nice lamp at a very reasonable price. Came in good condition, exactly as pictured.